Winnipeg Wesmen Women’s Basketball head coach Tanya McKay has announced the commitment of Shawn Pallister (Oak Park High School) to the University of Winnipeg Wesmen Women’s Basketball program for the start of the upcoming 2014-2015 Canada West season. 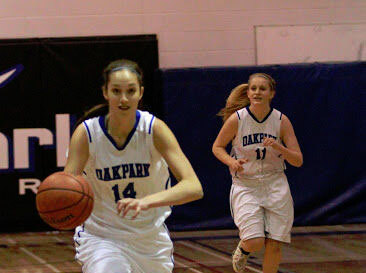 Pallister a 6-1 post averaged 12 points and 13 rebounds per game for the Oak Park Raiders this past season. She played an integral part in helping the Raiders reach the semifinals of the 2014 MHSAA AAAA Provincial Championships. Pallister was named a Tournament All-Star at the Oak Park Raiders Tournament this past January and was named an honourable mention in the Winnipeg Sun’s Annual Coach’s Poll of the Top High School Girls’ Basketball players in Manitoba. In 2013 she was a member of the Oak Park team that won the MHSAA Provincial Basketball title. “We are very pleased Shawn will be moving on to play with Coach McKay and the Wesmen program. An exceptional athlete with tremendous upside, she will have the opportunity to grow as player and student at the University of Winnipeg”, added Oak Park Raiders Girls Basketball head coach Murray Brown. An accomplished student, she is an honour roll student and serves as a Graduation retreat group leader at Oak Park. “We are very excited Shawn has chosen our Wesmen program for her University basketball career. At 6-1 and still growing, Shawn will make an impact with her size, rebounding and passing abilities. A very talented athlete who is just on the edge and ready to blossom into a very good University basketball player”, said Wesmen women’s basketball head coach Tanya McKay.